In my opinion, all you really need in order to cook great food is knowledge of proper cooking times and temperatures (as well as the ability to season). With that in mind I want to give you some turkey cooking time basics. This will allow you to season your bird however you like then cook it to perfection. – First of all, always make sure that your turkey is completely defrosted before you begin the cooking process. There are two safe methods for defrosting a turkey. 1) Defrosting in the refrigerator. To defrost in the fridge simply move the turkey from the freezer to ther fridge and allow the bird to defrost for about 24-36 hours for ever 5lbs. For example if you have a 12 pound bird you will need to move the turkey from the freezer to the fridge at least 2 1/2 days before you want to cook it. 2) The cold water method. This is the quicker defrosting method but it’s suggested that you roast the turkey immediately after defrosting. For this method simply completely submerge the turkey in cold water, changing the water ever 30 minutes. The turkey will defrost at a rate of 1 pound/30 minutes. So for instance the same 12 pound bird will be defrosted in approximately 6 hours using the cold water method. – When cooking all meat it’s a fundamental basic that you allow your meat to rest, loosely covered in foil, for at least 10 minutes after it’s removed from the heat source to allow the juices to be reabsorbed. Cooking a turkey is no different. If you do not allow your bird to rest and prematurely cut into it all of the juices will end up on your cutting board rather than in the meat and you’ll be eating dry leftovers for days! -The best way to insure a perfect turkey is to know exactly what the internal temperature of the bird is at all times. For this I recommend using a digital meat thermometer . Personally, I use one that stays in the roast the entire time and is connected to an external alarm/time that you can set to go off once the meat has reached the desired temperature. This way, you not only know exactly what temperature the inside of your meat is at but you also don’t have to pay as much attention to it since you’ll be alerted when it’s ready. 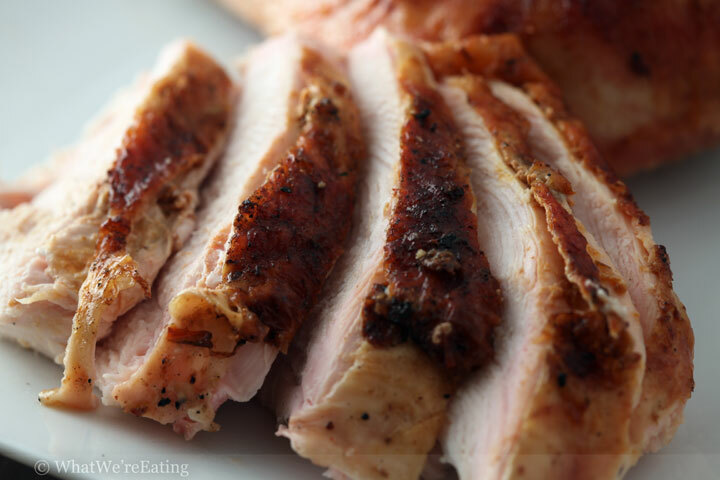 – For a whole turkey, insert the thermometer into the deepest fleshy part of the thigh not touching any bones. – For a turkey brest insert the meat into the middle of the meat, again making sure not to touch any bones. – For smaller turkeys (10-16 lbs) it will take approximately 15-20 minutes/lb at 325 to reach an internal temperature of 175. – For larger turkeys (16-24 lbs) it will take approximately 12-15 minutes/lb at 325 to reach an internal temperature of 175. – For smaller turkeys (10-16 lbs) it will take approximately 12-20 minutes/lb until it reaches an internal temperature of 175 degrees. – For larger turkeys (16-24 lbs) it will take approximately 12-15 minutes/lb until it reaches an internal temperature of 175 degrees. – Deep-fry turkeys in oil heated to 365-375 degrees. – If you brine your turkey make sure it is completely dry before you put it into the hot oil otherwise you will have scalding hot oil flying out of the frier. – For smaller turkeys (10-16 lbs) it will take approximately 3-4 minutes/lb in oil at 365-375 degrees. – For larger turkeys (16-24 lbs) it will take approximately 2-3 minutes/lb in oil at 365-375 degrees. – 350 degrees for approximately 18-25 minutes/lb until it reaches an internal temperature of 170 degrees. – 350 degrees for approximately 15-20 minutes/lb until it reaches an internal temperature of 170 degrees. – 325 degrees for approximately 15-20 minutes/lb until it reaches an internal temperature of 165 degrees. – approximately 15-25 minutes/lb until it reaches an internal temperature of 170 degrees. -approximately 12-20 minutes/lb until it reaches an internal temperature of 170 degrees. – approximately 15-20 minutes/lb until it reaches an internal temperature of 165 degrees. I am thinking of trying the method this year where you start cooking the bird breast side down, and then flip it over halfway through to brown the skin. I have heard it insures a moist breast. What do you think? I like all the different methods of cooking turkey. Maybe I will try something new this year. As my question will indicate, I don’t generally cook 😉 That being said… if I am cooking 2 bone-in whole turkey breasts side by side, and they are each 6 pounds… would I cook them together for a total of 3 hours? Or should I just cook them seperately for 1 1/2 hours each? I’m thinking that if I cook them together, it should be for less time. I’m new to cooking a christmas dinner for a big family, some great information for me to follow. Thanks very much for good ideas.